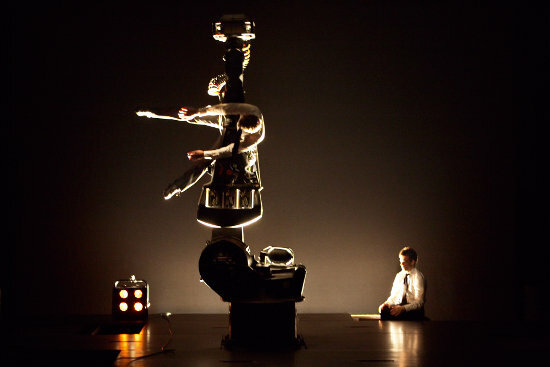 The strict, formal intelligence of director-mathematician Aurélien Bory gets another LIMF outing (after Plan B, More or Less Infinity and Les Sept Planches de la Ruse) with Sans Objet, a piece which puts two acrobats onstage with a giant mechanical arm that did heavy work building cars back in the 1970s. Anyone who saw Sept Planches will remember the exceptional mise en scène Bory can achieve with clean lines and the positioning and movement of non-organic, geometric shapes; robotics seems like an obvious next step. The press copy for Sans Objet also says it's a 'futurist fantasy' – which may make it the magic combination of circus and SF that Sideshow has so long been waiting for. Read Sideshow's review of Sans Objet.